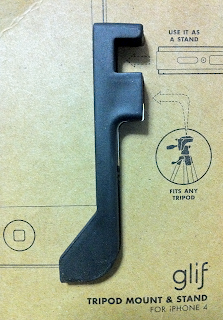 Since the iPhone 4 came out back in June, I have been looking for a low-cost way to get a tripod mount for it. While I love my 1080p video camera, most of the time I'd rather use my 720p iPhone 4 just for the convenience. Back in October, I was really excited about the startup company that makes the Glif and I donated $20 to the cause in return for the nifty little device. It arrived in the mail just in time for Christmas! The packaging is minimal (pictured, left). It shows you how you can use the Glif as a tripod mount and a stand. I think anyone who has a Glif should watch this Glif montage for all the ways you can use it. There are other iPhone 4 tripod mounts on the market but they are fairly bulky and weren't to my liking. When I had the iPhone 3G I bought the Joby Gorillapod for it. There is an iPhone 4 version of the Gorillapod but I didn't want to spend $40 for it and it doesn't allow me to use a real tripod. With the Glif, I can use it with my Gorillapod knockoff as well as my full-sized video camera tripod. It also doubles as a landscape or portrait stand for internet browsing, movie watching or the occasional FaceTiming. It costs only $20 and it can fit in your pocket. You can order the Glif here. Angry Birds Seasons is now available in the App Store. If you already have the Halloween edition, this is a free update. If you didn't then it's available for the iPhone for $.99 [iTunes link] and the iPad for $1.99 [iTunes link]. By the way, your Halloween Edition is still in the app. You just have to find it.